Clarence Seedorf’s Milan played extremely well – but couldn’t translate their dominance into goals. Seedorf changed no fewer than six players, despite winning 2-0 at Sampdoria last time out. Mario Balotelli was still unavailable. Juventus were without Arturo Vidal through suspension and Giorgio Chiellini was only fit enough for the bench, but otherwise Antonio Conte’s line-ups was as expected. Milan were superior for long periods, but lacked combination play and reliable finishing upfront – in stark contrast to Juventus, Serie A favourites according to some of the best sides in SportsbookReview.com. The game seemed set to be won and lost down Milan’s right, and Juventus’ left, because in the opening stages Kwadwo Asamoah kept finding an extraordinary amount of space down the flank – mainly thanks to Adel Taarabt’s lack of interest in defending. Juventus were free to hit crossfield balls towards him, although the wing-back’s first contribution was an embarrassing air-shot. Still, the space was down that flank. Juve’s problem, however, was that Taarabt was getting space on the break, and he was Milan’s most dangerous attacking player in the first half. With Asamoah higher up, it meant Martin Caceres was being drawn out of the back three to cope with him, and after the Moroccan dangerously dribbled towards goal a couple of times, Asamoah was forced to drop back and get goalside. Milan had won this mini-battle, and this meant Ignazio Abate could get forward on the overlap to play a few dangerous balls. Milan’s use of Andrea Poli was interesting. He played at the top of the midfield triangle, shutting down his near-namesake Andrea Pirlo, despite the fact he’s accustomed to playing in a deep position. He played this role well, and Pirlo’s influence on the game in the first half was minimal – although Milan suffered because Poli isn’t a real creative player, and was reliable rather than incisive with his distribution. The true creativity came from Kaka and Taarabt, and the overall format of the side was interesting – a 4-2-3-1 with a cautious player in the number ten role, but two natural number tens drifting in from wide. 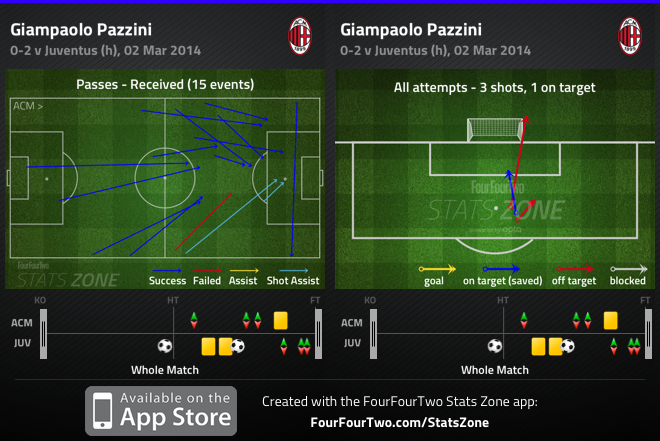 A common method of Milan’s attack, however, was hitting long balls towards Giampaolo Pazzini. 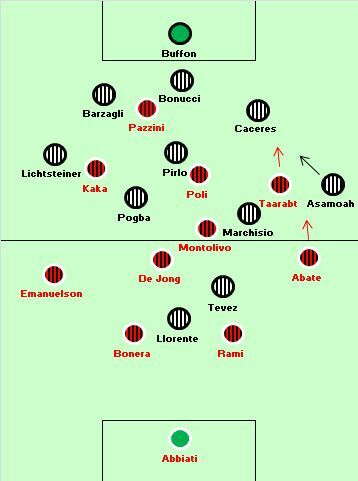 The striker played towards the left and combined nicely with Kaka, causing Andrea Barzagli problems down that side. Pazzini is amazingly inconsistent, but when on form his movement is excellent, and he occupied Juve’s back three excellently, creating space for midfield runners behind. Juve struggled in midfield for long periods, being dominated in terms of possession (even if their gameplan wasn’t necessarily to control the ball) and struggling to work the ball through the centre of midfield. The absence of Vidal, who brings energy, tackling, passing quality and a goalscoring threat, was obvious. Pirlo was occupied excellently by Poli while Paul Pogba appeared tired, and not his usual dynamic self. Claudio Marchisio made some interesting runs towards the left of the pitch but rarely received the ball. Milan’s midfield remained strong, with Riccardo Montolivo the most impressive player in this zone, winning tackles and playing some good long passes. Juventus basically won this game upfront, via the individual quality of the strikers – and the relationship between them. This is arguably something they didn’t do last season, and last summer’s signings of Carlos Tevez and Fernando Llorente have given another dimension to the side – otherwise, it’s last seasons’s XI. Not only do Llorente and Tevez offer very different qualities, they consistently combine well. Rarely do you see two strikers with such great understanding of each other’s positioning and movement, and the intricacy of some of their one-touch play is absurdly good. 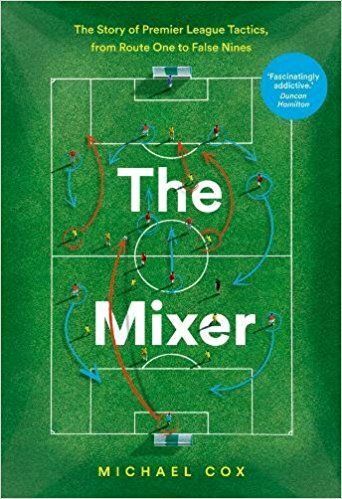 It’s amazing how often a diagonal pass seemingly played into one of them is actually dummied for the other – let’s call it a Yorke-Cole move – and those combinations repeatedly drag defenders out of position, creating space to attack into. They did miss Vidal as the ‘third man running’, however, and perhaps the one thing Tevez and Llorente miss is genuine acceleration – they don’t sprint in behind much. That forward running came from other sources for the opener, with Marchisio collecting the ball in behind the Milan centre-backs from a long Leonardo Bonucci pass, then Stephane Lichsteiner charging forward from nowhere to receive Tevez’s deft touch and cross for Llorente to score. Opponents can rarely cope with a third Juve player running in advance of their centre-forwards. Juve were much more comfortable in the second half, and a noticeable change was the advanced positioning of Pogba. This pushed back Nigel de Jong and opened up more space in the Milan midfield, and the home side seemed much more disorganised without the ball. Indeed, it was partly because of this that Tevez was allowed time to thump in a shot off the crossbar from 25 yards, which ended the contest. Juventus wouldn’t have won this game in 2011/12 (when they had five 0-0s) or 2012/13 (when they had two). Now, they have two top-class strikers and therefore have scored in every single league game this season. I tend to disagree with your analysis, I mean Milan were superior during first half but they clearly spent too much, then disappeared in the second when players were exhausted, see Taarabt. Seedorf does have Milan playing better and although they haven’t looked particularly impressive in the final third, they have created a number of chances against Juventus and Atletico…… They’ve simply been very poor at finishing(especially Kaka and I’m not convinced Taarbat is that good). 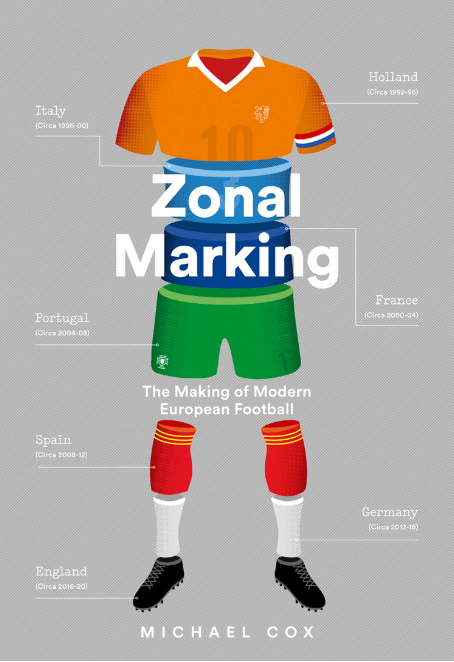 The fluidity and understanding just doesn’t seem to be there, whereas it was clear as day in contrast to Juve. Wonder if Seedorf will bring back the 4321 he played under Ancelotti, and in which Kaka thrived in (albeit with younger and quicker legs). to me, juve seems to get tired already. Seedorf got the right formation to trouble juve. With the wings dominated and centrally pirlo was occupied, it surely was a game for Milan to win. Unfortunately I think seedorf did not cope with conte’s changes tactically..seedorf’s inexperience was obvious.